In the beginning of January 2017 Garmin announced the release of the new Fenix 5 series GPS watches which are replacing the highly popular Fenix 3 series watches (note that a Fenix 4 series will not be launched, according to Garmin). The Garmin Fenix 5 collection includes three different and highly customizable GPS watches – the Fenix 5S, Fenix 5 and Fenix 5X. These watches are designed for various sports (from running to swimming) and offer numerous features which come in very handy for hiking, mountaineering and similar outdoor activities. However, as they have a very attractive (if not elegant) design, they are also perfect for everyday use. Similar to competitive products such as Suunto Ambit and Traverse watches, the Garmin Fenix 5 watches have many advanced features which can be efficiently used for hiking and mountaineering. This includes GPS tracking and navigation, barometer, barometric altimeter, electronic compass and thermometer. However, Garmin raised the bar, when it comes to hiking watches, by equipping the new Garmin Fenix 5X watch with mapping. Yes – the watch can actually show a topographic map on its colorful 1.2” display! Mapping is indeed a huge step forward as it allows you to see the terrain that awaits you and thus to choose the optimal route to your destination. In comparison, competitive products can only show your location along with waypoints and GPS routes (breadcrumb trails to follow) without the terrain details. While this feature aides you in reaching a certain location, it definitely doesn’t help you to choose the optimal route to it – imagine searching for a bridge to cross a river on the way to your destination when the watch only shows your location, your direction and the destination. Please note that only the Fenix 5X watch comes with mapping while the Fenix 5 and Fenix 5S do not support maps. In the following we’ll look deeper into the features and functionality of the Garmin Fenix 5 series watches. The Garmin Fenix 5 collection consists of three different watches (Fenix 5S, Fenix 5, and Fenix 5X) which differ by size, weight, color options, features and price. Despite their sleek design, the Garmin Fenix 5 series watches are made of highly durable materials. The front side of the case is made of composite materials while the rear side is made of stainless steel. The bezel and the buttons are also made of stainless steel for good durability. The watches are waterproof down to 100 meters below the surface. All the Garmin Fenix 5 watches are also available with Sapphire lenses which offer much better protection against scratches than the more common mineral crystal lenses. Naturally, the Fenix 5 models with Sapphire lenses are also more expensive (approximately $100 more than the versions equipped with mineral crystal lenses, depending on the model). I would especially recommend the Sapphire model to those who often do technical activities (climbing, technical mountaineering etc.) as it is very easy to scratch the lens on cliffs and rocks during such activities. My current Suunto Ambit 2 watch (with mineral crystal lens) got scratched pretty fast although I am always wearing it covered by my sleeves, gloves etc. Each watch comes with a simple silicone band (for sports) and an additional, more elegant, band (which at pricier models is made of metal or suede). The watches use the QuickFit system which allows you to easily and quickly change the band – you basically just press a button and the band pops off. The bands can also be purchased separately – they retail at $ 50 (silicone bands). 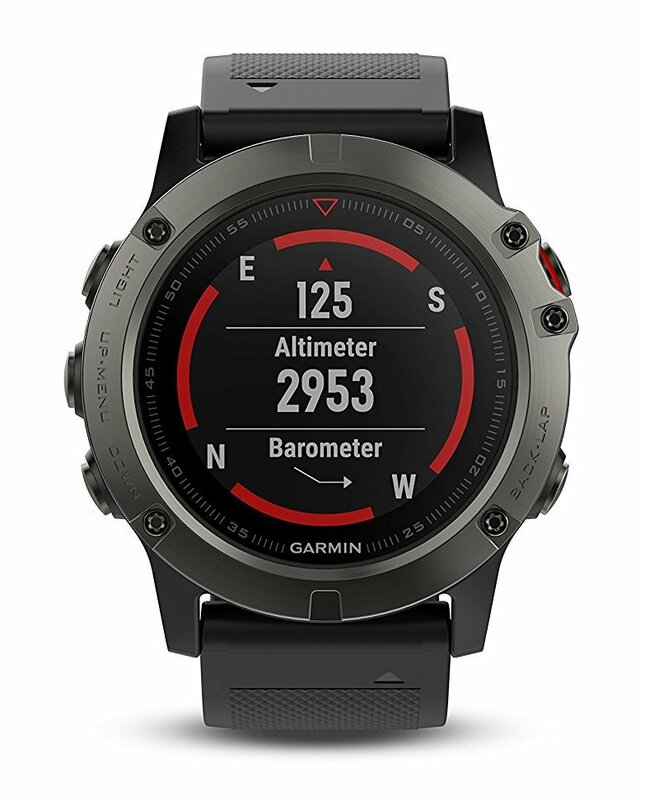 The Garmin Fenix 5 series watches feature GPS navigation and tracking, digital 3-axis compass, barometer, barometric altimeter, thermometer, gyroscope and advanced connectivity. The digital 3-axis compass shows you your direction in degrees and can be used for navigation in case that GPS signal is not available. The watch does not have to be completely leveled for precise measurements as the digital compass handles the tilting. The barometer provides you with information about short-term trends in the atmospheric pressure (shown as a graph) and can thus be used for predicting the weather; an increasing atmospheric pressure indicates a weather improvement while a decreasing atmospheric pressure indicates a worsening of the weather. A sudden drop in the atmospheric pressure indicates formation of storms. The altimeter shows you how high above the sea level you are. It uses barometric data to calculate the altitude and thus it works even when GPS signal is not available. The thermometer allows you to easily measure the air or water temperature. For more precise measurements the watch can be wirelessly connected to the Garmin Tempe external temperature sensor (as the thermometer is otherwise influenced by your body heat). The gyroscope improves tracking accuracy when the watch is in UltraTrac mode. In UltraTrac mode the watch periodically turns off GPS in order to increase the battery life. While the GPS is turned off it uses the accelerometer and gyroscope for tracking. The UltraTrac mode comes in handy on hiking and backpacking trips where it might be hard to get access to electricity for recharging the battery. 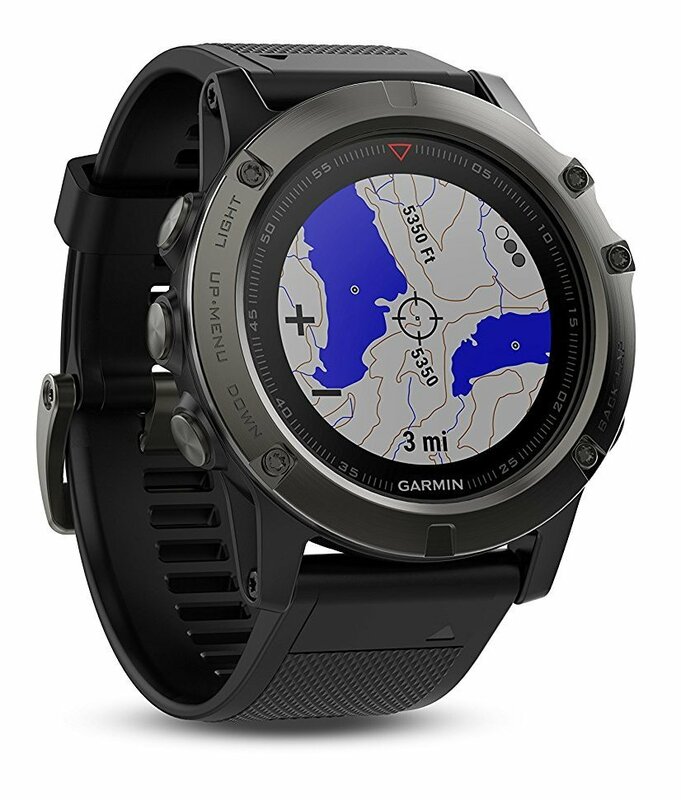 The Garmin Fenix 5 series watches also support GLONASS in addition to GPS. Therefore, the watch has more satellites at its disposition and is thus more likely to get a satellite fix in difficult terrain (dense woods, narrow valleys etc.). However, note that also competitive products such as Suunto Ambit 3 Vertical and Suunto Traverse support GLONASS. The Garmin Fenix 5 watches allow you to save up to 1000 waypoints and 30 routes. The watch can provide you with navigation to the waypoints and visual route navigation. On the Garmin Fenix 5X watch the routes and waypoints are shown as an overlay on a full-color map (the watch comes with the TOPO U.S. mapping). Additional useful navigation features supported by the watch are the Around Me feature, LiveTrack and TracBack. In the Around Me mode the watch displays locations nearby in a simplified graphical interface for a good overview while the LiveTrack mode allows you to follow your friends’ locations in real time (the watch has to be paired with your smartphone connected to the internet for this feature to work). The TracBack feature generates a visual route back to the starting point for you. The Garmin Fenix 5 series watches also track (record) your activities (hiking, running, swimming etc.). In the Garmin Connect app you can see in-depth information of your activities which includes duration, distance, ascent and other useful data. 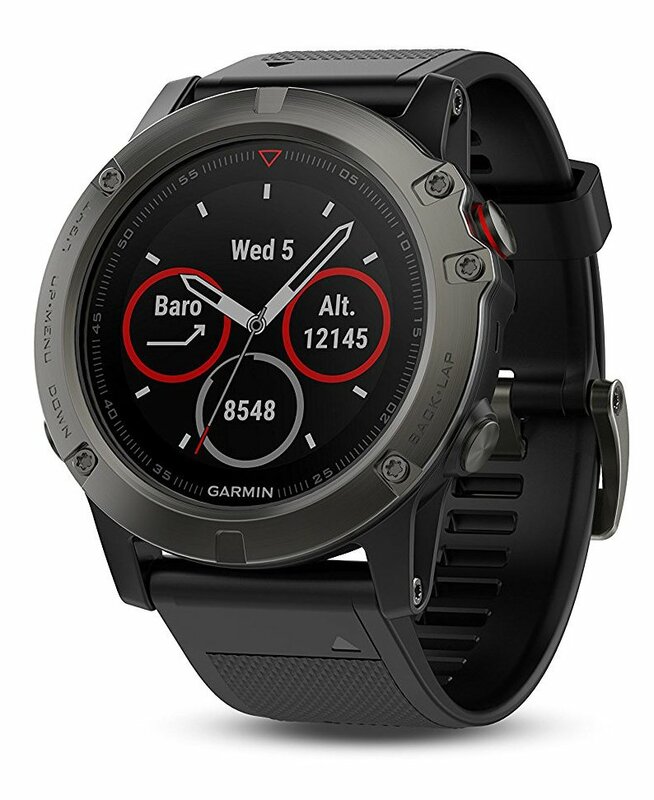 All Garmin Fenix 5 series watches are equipped with a Bluetooth adapter which allows you to easily connect the watch to a smartphone (however, the Garmin Connect Mobile app is required). When connected, you can see emails, texts and alerts from the phone directly on the watch. 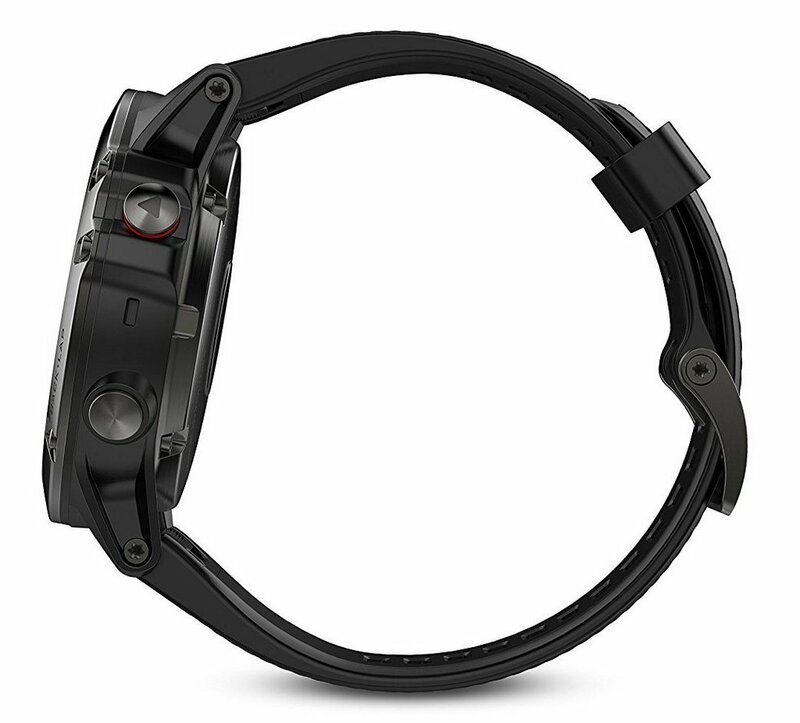 The Bluetooth adapter also allows you to connect the watch to other devices, for example a heart rate monitor chest strap. 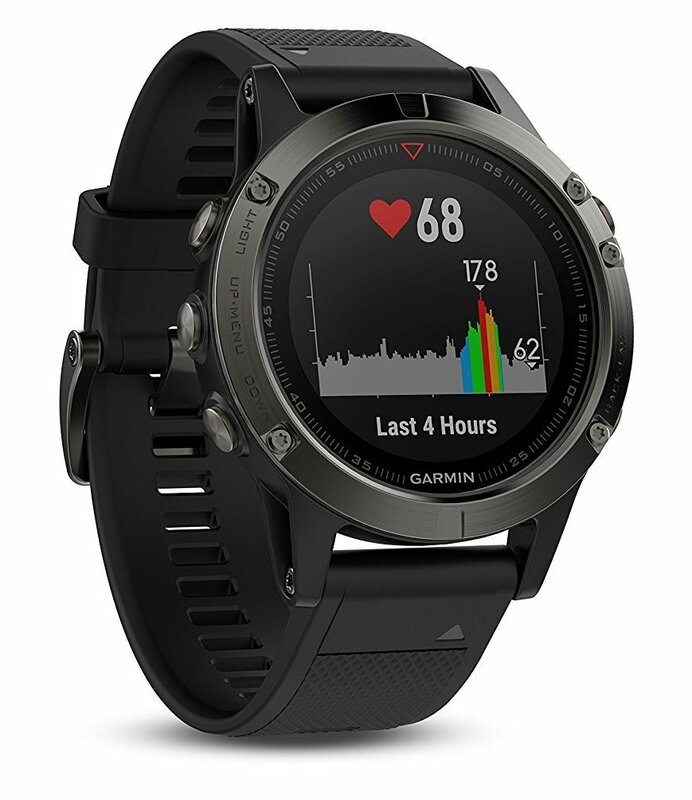 Nevertheless, all the Fenix 5 watches come with a wrist-based heart rate monitor (Elevate technology) which allows you to monitor your heart rate without wearing a chest strap. The Sapphire glass models also feature Wi-Fi and thus they can send the recorded activities to the Garmin Connect app even when they are not paired with your smartphone (with internet access) via Bluetooth. 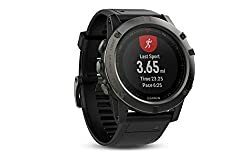 Dilemma: Garmin Fenix 3 or Garmin Fenix 5? I could imagine that many hikers will be in doubts about whether to buy the Garmin Fenix 3 (which is now discounted) or the new Garmin Fenix 5. From the perspective of a hiker, the advantages of the Garmin Fenix 5 in comparison to the Garmin Fenix 3 are the maps (only 5X model), gyroscope and the LiveTrack feature. It’s too soon to discuss how useful the maps will be, as it all depends on the implementation (Will the details on the map be seen clearly? Will it be possible to zoom in/out on the map etc.?). The small screen of the Fenix 5X (although big for a watch) will naturally limit the usability of the maps compared to GPS devices. The gyroscope, on the other hand, seems to be very useful for long hiking/backpacking trips as it will improve tracking accuracy in the UltraTrac battery saver mode (Garmin states that the battery life of the Garmin Fenix 5X is 50 hours in this GPS tracking mode). 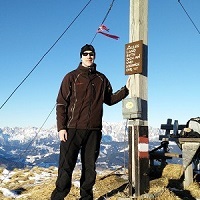 The LiveTrack feature could be especially useful for those who often hike in a group – as it provides you with the location of your fellow hikers (if they also have a Garmin Fenix 5 watch and you all have Smartphones connected to the internet). That way, members of your group can hike in their own tempo while still knowing the location of the others. Note: Garmin implemented maps pretty well – it is possible to zoom in/out on the map and you can pan the map around for good overview. See the below video for more information. 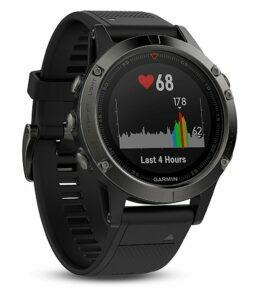 The Garmin Fenix 5 watches definitely introduce some very useful and innovative features (especially mapping and LiveTrack) and thus it’s very likely that they will be highly popular among hikers, mountaineers, trekkers and other outdoor enthusiasts. The Fenix 5 watches will start shipping out in March 2017 (according to Garmin) and are currently available for pre-order. If you want to get an overview of the hiking watches which can compete with the Garmin Fenix 3 and 5 series, check out our review of the Best Watches for Hiking. Note: Garmin Fenix 5 has been released in March 2017.